After completing his master’s degree, Schubert spent four years studying compound semiconductor crystal growth as a scientific staff member at the Max Planck Institute for Solid State Research. He later joined AT&T Bell Laboratories in Holmdel, N.J., where he spent two years as a postdoctoral fellow. From 1988 to 1995, Schubert served as principal investigator in the Research Division of AT&T Bell Laboratories in Murray Hill, N.J. In 1995, he joined Boston University and was appointed to a full professorship in the Department of Electrical and Computer Engineering. He also was named an affiliated member of the Photonics Center. At BU, he was responsible for GaN materials characterization and the fabrication of compound semiconductor devices – particularly GaN-based devices. He continued to serve as an adjunct professor for Boston University from 2002 to 2003. 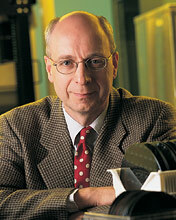 In 2002, Schubert was appointed Senior Constellation Chair of the Future Chip Constellation and Professor in the Department of Electrical, Computer, and Systems Engineering at Rensselaer. Schubert authored the books, Light-Emitting Diodes, 2nd Edition (2006); Light-Emitting Diodes, (2003); and Doping in III-V Semiconductors, (1993); and edited the book, Delta Doping of Semiconductors, (1996), all from Cambridge University Press. Schubert also has published more than 200 research papers, has contributed several book chapters, and is inventor or co-inventor of about 28 issued U.S. patents. He was elected a Fellow of the Institute of Electrical and Electronics Engineers (IEEE), American Physical Society (APS), Optical Society of America (OSA), and the International Society for Optical Engineering (SPIE). He also has received the Senior Research Award of the Humboldt Foundation, Discover magazine’s Discover Award for Technological Innovation, Research & Development Magazine’s R&D 100 Award, and Boston University’s Provost Innovation Fund Award. Schubert’s primary research interest is in the field of compound semiconductor materials and devices. His studies include epitaxial growth, materials characterization, device processing and fabrication, device design, and device characterization. Devices include heterobipolar transistors, lasers and light-emitting diodes for communication, lighting, and sensing applications. Schubert has made pioneering contributions in compound semiconductor materials and devices. His accomplishments include the discovery and first analysis of alloy broadening, the development of delta doped structures, superlattice doping in p-type GaN and AlGaN for increased acceptor activation, compositional parabolic grading for elimination of band discontinuities in unipolar heterojunctions, and crystallographic etching of GaN. He demonstrated the first resonant-cavity light-emitting diode (RCLED), which is the first practical device taking advantage of spontaneous emission enhancement; he also showed the first spontaneous emission and absorption enhancement in Er-doped Si/SiO2 microcavities. In 2008, his leadership of a team of faculty investigators coming from multiple universities resulted in the awarding of the Engineering Research Center for Smart Lighting by the National Science Foundation. In 2008 and 2009, he served as Founding Director, Director, and Principal Investigator of the Rensselaer-Polytechnic-Institute-led center. The center has brought more than $ 40 million to Rensselaer Polytechnic Institute. His students have been extraordinarily successful with several being faculty members in academia and several holding leadership positions in industry. Three of his graduate-student advisees were finalists in the $ 30,000 Lemelson Student Prize competition and two of his advisees won the Prize. Ph. D., Electrical Engineering, with honors, University of Stuttgart, Germany, 1986. M.S., Electrical Engineering, with honors, University of Stuttgart, 1981. B.S., Electrical Engineering, University of Stuttgart, 1978.